It’s the most wonderful time of the year, and as the days tick closer to the 25th, you can find “all things merry in bright” right in Downtown Lynchburg. Whether you’re doing some last-minute shopping, dining out, or simply looking for fun holiday-inspired activities, Downtown offers enough to keep you celebrating all season long. Appropriately named, after trying some of Mrs. Joy’s Absolutely Fabulous Treats, you may just catch yourself humming “Joy to the world.” Not only will you find peppermint macaroons; iced sugar cookies; fresh, glazed donuts, and much more in this new shop, you can even watch them decorating tasty creations right at the spacious back counter. And for a unique date night or family activity, sign up for a holiday cookie decorating class taught in this cozy location recently opened on Commerce Street. Find more information on their Facebook page. And don't forget to visit Altus Chocolates and Simply Irresistible Bakery for event more decadent goodness! 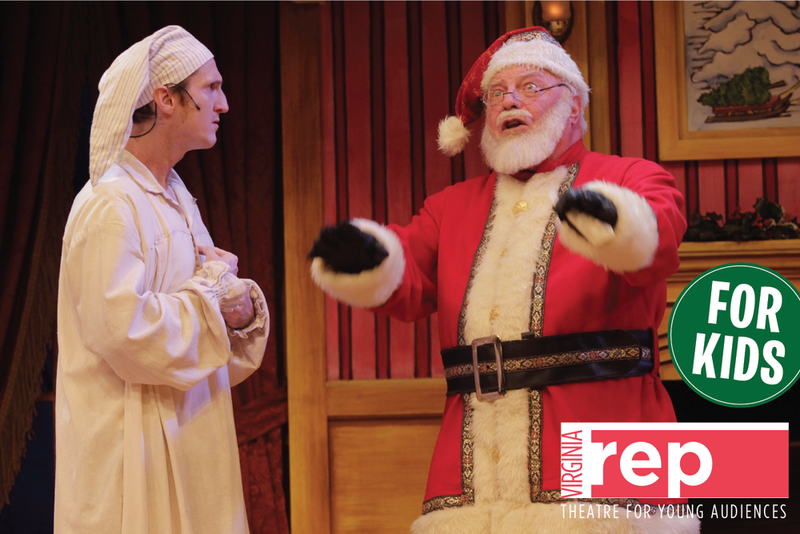 Few things convey the magic of Christmas like Santa Claus. 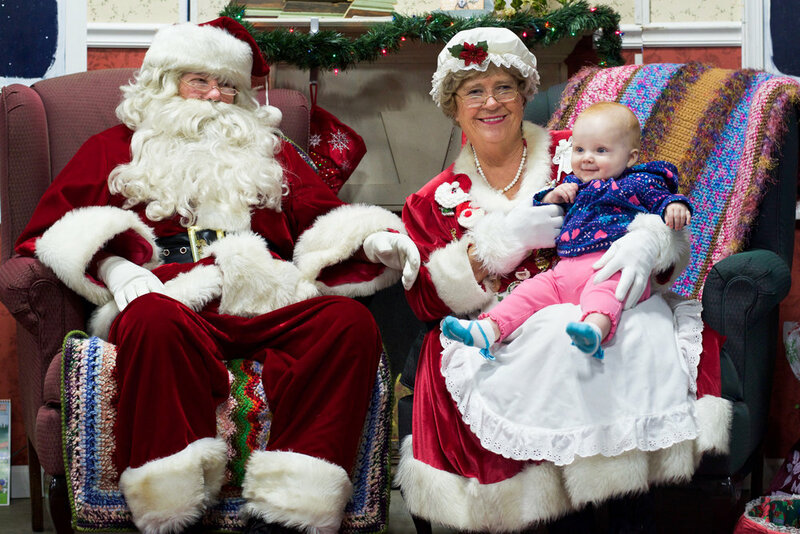 You can find him and Mrs. Claus at the Mistletoe Market Saturdays this month where your children can meet them for free; and, while you are welcome to take photos yourself, you can download professional shots from the Lynchburg Community Market blog as well. Be sure to take advantage of the seasonal horse drawn carriage rides—only $2 per person—which tour the Downtown area. And before leaving, browse the local and seasonal produce, greenery, homemade wreaths, décor, wares, and more during the Market’s extended hours (stands open until 3 p.m.). Visit the Mistletoe Market on Saturdays—Dec. 10, 17—from 7 a.m. to 3 p.m. Santa visits and carriage rides offered on Dec. 10 from 10 a.m. to 2 p.m. While any trip downtown should include a stop for photos at the Craddock Terry Hotel Christmas tree, why not go a step further and gift yourself a night away in this luxurious hotel? There, you’ll find every room outfitted with its own mini-Christmas tree and a complimentary breakfast “basket” (literally, a very fun, old-fashioned shoeshine box) delivered right to your door in the morning. You can have it all: total relaxation and holiday spirits will both be at an all-time high after a stay here. Make sure you don’t missthe hotel’s newest sculpture—a LOVE high heel merging their iconic symbol with Virginia’s state motto—poised to greet visitors at the curve of Commerce Street. See the show at 9:30 a.m. and 12:00 p.m. on Saturday, December 17; more information on their site. Pick up tickets now for the Roaring on the Rooftop New Year’s Eve bash being held at Terrace View by the James on December 31. Dress to the nines for this “1920’s NYE Affair” and enjoy hors d’oeuvres and a cash bar while dancing the final hours of 2016 away. Rooftop views, glasses of champagne, and live music should go a long way to ringing in the new year in high style. Downtown just got a whole lot cooler with the opening of its first “speakeasy”—Bootleggers is offering 35 bourbons and a variety of burgers and beer in a unique setting sure to warm you up after a stroll down the Bluffwalk. Take advantage of extended vacation days or bring in out-of-town visitors to see all that Downtown now has to offer; you’ll enjoy taking a break from cooking at home and even catch a view of the James from Bootleggers’ location on the south side of the Bluffwalk. Find hours and menu options on their site. The iconic music of “The Nutcracker” immediately brings to mind flittering sugarplum fairies. This year, take advantage of a high definition viewing option at the Academy on December 18 where they will be screening the Vienna State Opera House’s ballet performance at 2 p.m. The ballet stars Liudmila Konovalova as Clara, Vladimir Shishov as Drosselmeier and The Prince, and features choreography by Rudolph Nureyev. Find more information on their site. Thanks to the burgeoning growth of Downtown’s restaurant scene, there are several unique options for dinner and drinks out with friends on New Year’s Eve. Throw back some oysters and a variety of drafts in the casual and rustic setting at The Water Dog, or try some Irish fare and Guinness at Kegney Brothers where they’ll have live music throughout the evening. Wherever you go, food and friends will be in abundance. Find more at Kegney Brothers and The Water Dog. Dropping temperatures make warm drinks a must-have, and with The White Hart and Cafe Bliss anchoring the two “ends” of Downtown, you can take your pick of handcrafted, specialty beverages before working your way down Main Street to take in the beautiful window displays. Of course, if you enjoy some drinks (and treats!) at both coffee shops, we won’t tell. Christmas only comes once a year after all. Not a coffee person? No problem. Grab a seasonal tea at Good Karma Tea Co.
Find more at The White Hart and Cafe Bliss. See how some of Lynchburg’s most historic spires deck the halls and take a peek inside these churches during The Interfaith Outreach Association’s Open House on December 10. Covering a five-block area central to Downtown, the nine participating churches will each present musical performances throughout the event. Running from 10 a.m. to 2 p.m. on December 10, you can find more information about this annual event here. Keep up to date by following Lynch’s Landing on Facebook and remember the City is offering free two-hour holiday parking through January 1.